7404 1 Hex Inverter. DM7404N. 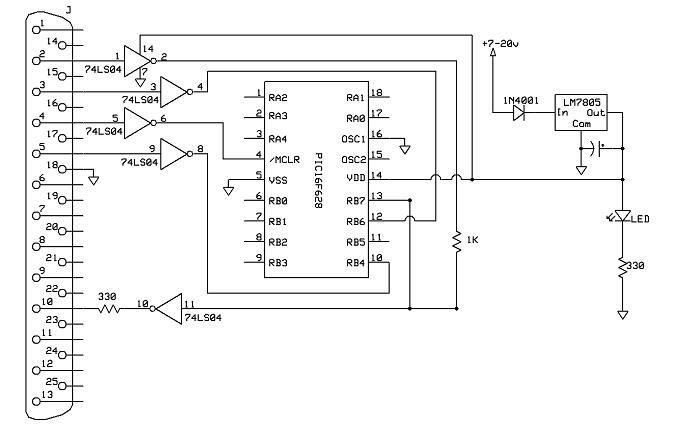 PIC 16F628A 1 8-bit CMOS FLASH-based Microcontroller. 1. What is happening with pin 14? Is VDD connected to ground? That's just power. Vdd of Vdd and Gnd. 2. What is the purpose of the capacitor between Com and Out of the Positive Regulator LM7805? 3. Can I power the circuit with a 9V Battery?